Federal introduces Federal Premium Black Cloud TSS waterfowl shells, which deliver hard-hitting performance on high-flying birds. These blended loads feature No. 7 or 9 TSS with BB or No. 3 FLITESTOPPER steel. 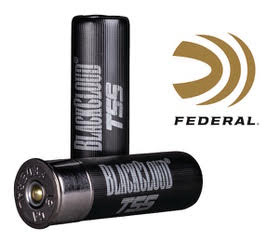 Shipments of Federal Premium Black Cloud TSS ammo have been delivered to dealers. Black Cloud TSS carries on a lethal legacy, blending proven FLITESTOPPER Steel pellets and 18 g/cc Tungsten Super Shot. With 56 percent higher density than lead and more than double the density of steel, TSS pellets maintain velocity farther, hit harder and penetrate deeper than any waterfowl payload ever has. The swarm of shot leaves no chance for escape with the FLITECONTROL FLEX wad, which opens from the rear for a controlled release of the payload and the deadliest, most consistent patterns.